At Born Again Pews, we use oak for all our church furniture — pews, pulpits, altar tables, and all. Why? Historically, white oak was used in shipbuilding because it’s waterproof and durable. Red oak was commonly used for wagon wheels and wood floors. In other words, people have always used oak when they wanted what they built to last. English historians often see oak church pews built in the 1600s still in use hundreds of years later. There are a lot of different things to consider when choosing a material to build with. The two most important are durability and aesthetics, and oak is a favorite in both of those categories. Oak is a very durable and beautiful wood, and so it makes sense that furniture made from oak is long lasting and nice to look at. Oak is hard to damage, so if you you’re looking to buy furniture that will be around for a while, oak is the way to go. Another good thing about oak is that it that it is versatile. You can give oak furniture a stain for a nice deep color or put a clear coating on it to preserve its natural look. Oak can be used to create pews and other church furniture of almost any style. The combination of strength and beauty make oak the perfect material for church pews. You want your church’s pews to be used by multiple generation. 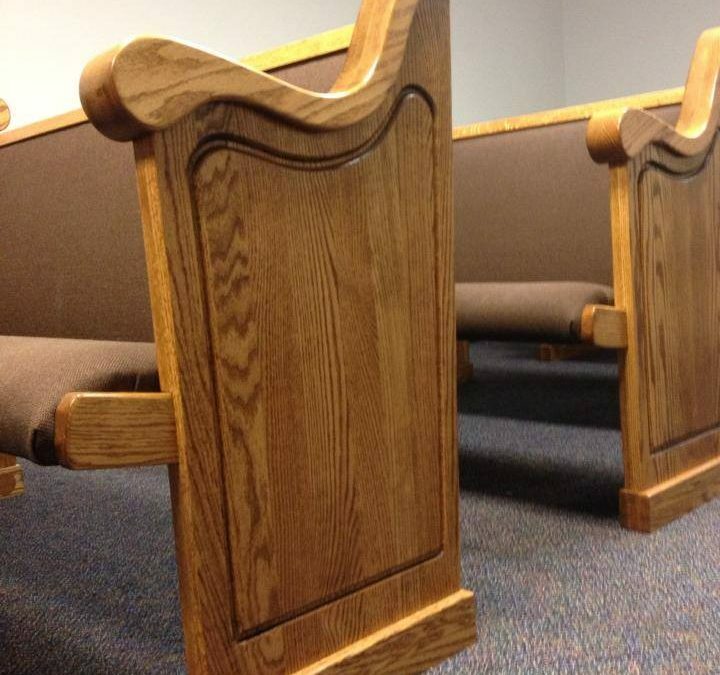 Just as you might cherish your grandfather’s watch, your church will cherish the pews installed by the current congregation for many years to come. In churches as in families, history is important, and physical objects hold that history. They help us to remember the past and the people who came before us. In a digital age, it’s satisfying to have physical objects that can hold sentimental value. Being able to recall the rich colors and the smell and feel the oak furniture that has been passed down over the years is a feeling that will be cherished by the churchgoers of the future. But only if the current churchgoers plan for that future. Choosing oak pews is one very good way to do that. Call us today to see how affordable oak pews can be.